one of the tips is to wear red lipstick. Men love it. If you really want to get attention, wear red – the brighter, the better. Red! 101, Ravishing, Strawberry Lips and Berried Treasure gloss. All dressed up in RED! 101 for JOSH GROBAN! Eyeshadows in Porcelain, Iced Mocha, Twinkle Taupe with Espresso applied wet as eyeliner. Eyeshadows: Tutu Cute, Porcelain, Iced Mocha and Espresso applied wet as eyeliner. My son said Ravishing was “beautiful”. It looks nothing like the solid bullet in the tube. To soften the look and add a touch of shimmer, add a dab of Berried Treasure gloss. My Night as a Blonde! Strawberry Lips is a lovely semi-sheer muted red suitable for anytime. Berried Treasure gloss is luscious on its own or layered with your favorite lipstick. With any red or other intense lipstick, base prep is important to look your best all day/night. Exfoliate and apply Rallye Balm for smooth, even coverage and dimensional color. Line your lips with foundation and/or a flesh-colored lip pencil to prevent bleeding. The Ultimate Guide to Red Lipstick has some additional tips for perfect red lips. Now it’s YOUR TURN! Go to Red Apple Lipstick and try something new! The sample packs make it easy to try several shades to find your favorite. *Dislosure: Products for this review were provided at no cost to me by Red Apple Lipstick. 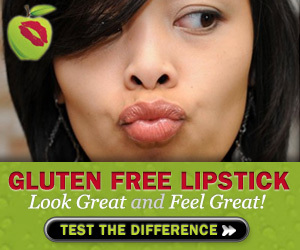 This entry was posted in Beauty and tagged gluten-free, lips, makeup, Red Apple Lipstick on November 5, 2013 by Pamela.